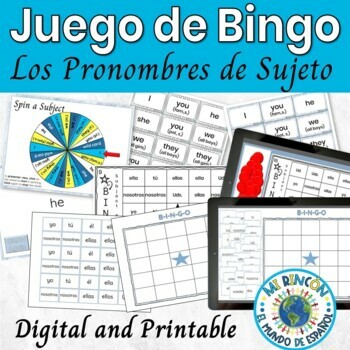 There is no better way to practice or review Spanish Subject Pronouns than the classic game of BINGO. 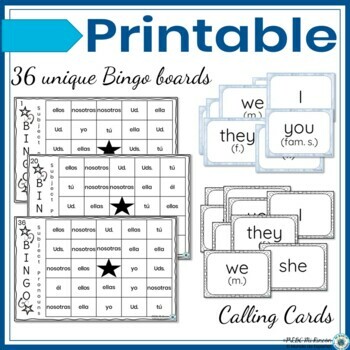 The 15 random boards and calling cards include 10 subject pronouns. Play it as a class or divide the class into groups. The subject pronoun vosotros is not included, but the text is editable and there are blank spaces so that it can be added. Use this classroom activity to help students acquire a good working knowledge of Spanish subject pronouns. 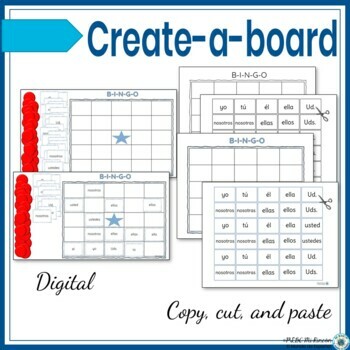 Print out the boards, grab some bingo markers, cut the calling cards, and you are ready for some fun learning. Alternatively, use the blank boards. Students can fill the blank board by writing the Spanish or English subject pronouns. 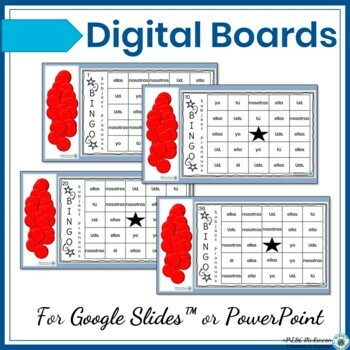 The included squares can be laminated and randomly placed on the board by students. Click here to follow my store, Mi Rincón ¡Aprende Conmigo!, and be alerted of updates and specials. Leave feedback it helps me and earns credits toward future TpT purchases click here to learn how it works. Using the “Mark as helpful” button is a way for you to let other TpT'ers know if a comment from another Buyer was helpful to you. I hope that you are able to use this product over the years and that it helps alleviate some of the pressure and time involved in lesson planning and preparation. Please check my store, Mi Rincón - !Aprende Conmigo! for additional products that may be useful in your classroom. By purchasing this product, you agree to the applicable license terms set forth by teacherspayteachers.com at the time of purchase as well as to the products terms of this use included with the product. The purchaser understands that this product is for his/her use only and cannot be modified or sold in any form.